Ingredients: 2 cups flour, 2 teaspoon baking powder, 1/4 teaspoon salt, 1/2 cup margarine or butter, 2/3 cup sugar, 2 eggs, 1/2 blueberries and some chocolate! 3. cream marg and sugar then add eggs. I made this for the Daddy's my hubby and my Dad, it was enjoyed by all! oh and this is my blueberry plant, no blueberries yet but with a little luck! wow...blueberry and chocolate are a classic combination, this would make a coffee break more enjoyable! YUmm Bluberry and Chocolate ...great combination. Looks delicious and easy! I will try it. I really liked the combo...sounds good,will giv it a try.. Cool Reb-send it for the BSI challenge,the ingredient for this week is blueberry!! Yum! I am also thinking on the combination of blueberry and chocolate (to replicate that dessert I recently had in Alinea). Love it, Rebecca. Great idea. Sweta: thanks Sweta will do! 5 star foodie, thats cool it reminds u of a 5 star restaurant i am touched !! This looks so easy to make and blueberries are on sale this week. Thanks for your delicious entry! My Dad and I just planted my blueberry bush! I'm crossing my fingers too! 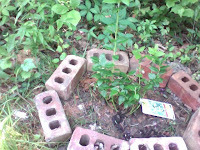 A blueberry bush! I almost came home from the garden mart with a blackberry bush but decided to wait until next year and properly prepare space for it before laying down mulch. Blueberry and chocolate can't beat that combination. =) Yum!! Good luck with the blueberries! It reminds me of my lone cherry tree outside... hopeing to get one cherry this year! Denise I know what you will be buying then ! Lisa; good with afternoon tea! Jenn: love this combo too, also good in pancakes with nutella! Blueberry and chocolate! Sounds delicious. I love the combination. Yum! Blueberries and chocolate are so good together and this looks wonderful. Fun! When I was a child we grew raspberries and we had a grape vine. One summer we made a ton of jelly, it was fantastic. The cake looks awesome. I love desserts with a little added nutrition! I wish I could have a taste! Double wow!! Blueberries and chocolate!! I wish I could get a forkful from my screen.. I love the blueberry and chocolate combo and this looks very simple to make, but very gourmet and delicious! Great post! I don't think I've ever had blueberries w/ chocolate...other than dried blueberries. Sounds delicious, Rebecca!! Gina: yep a good way to look at it ! Hummingbird: will send you some! Peachkin: that would be cool! Kamran: thanks but your pineapple upside down cake takes some beating! 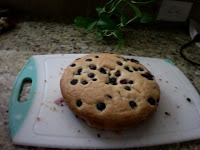 first time here n found your blog really nice......the cake is perfect but i liked your blueberry plant more.....would like to see more pictures of it while flowering n fruiting.....we don't get blueberries here in India n i wonder if i can grow it here. please do visit n tell me if you like it. Blueberry and chocolate chip!! Count me in!